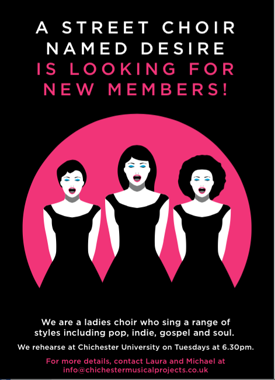 Chichester's All Ladies Choir is ready to welcome you to a fun, friendly time, singing contemporary music in harmony. With styles ranging from pop to gospel, we're sure there's something to suit your taste. Come and join us on Tuesday evenings at the University of Chichester, where we rehearse. We aim to give two/three concerts a year – we hope you can be in the next one!